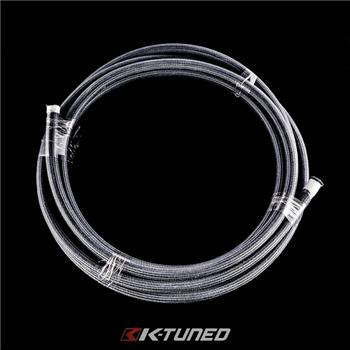 K-Tuned Plumbing - High Pressure Kevlar Braided Teflon Hose UNIVERSAL - Dezod Motorsports Inc - Home of the automotive performance enthusiast since 2002. K-Tuned High Pressure Teflon Hose has been specifically designed to meet the demands of high pressure applications. The interior Teflon liner is smooth on the inside to improve the overall flow capacity, while the outside of the liner is ribbed for improved flexibility. The outer layer is made from a strong and durable woven Kevlar braid that is finished with a clean dark grey color. The final result is a hose design that offers both higher flow rates and higher pressure ratings when compared to most conventional Teflon lined hoses with crimped hose ends. The 6AN hose is rated up to 1200 psi and 16AN is capable of 750 psi. Our HP Teflon Hose is compatible with several different race fuels including E85, E10, and methanol. It also works fine with oils, other lubricants and engine coolant. Available in sizes 6AN to 16AN by the foot. Assembly is very simple because no special tools are required. Even the larger 12AN and 16AN hoses, which are normally painful to work with, are very easy to assemble. Complete pressure and flow details are outlined in the chart below. Please note that our K-Tuned HP AN Fittings must be used with our HP Teflon Hose to ensure proper fitment and seal.